F3 Engineering has been selected to receive a three-year HUBZone award by Defense Logistics Agency (DLA) Aviation. Valued at over $4.5 million, the contract, which involves production of power distribution panels for aviation ground support equipment for the Kiowa weapon system, is the largest HUBZone award in F3's history. 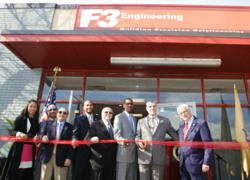 F3 Engineering President and Managing Partner Odilo Vazquez, PhD (second from right) celebrated the grand opening of the company’s new location in Paterson’s HUBZone in January. F3 has managed to secure approximately half of the HUBZone awards it has bid on. F3 Engineering, an aerospace engineering and manufacturer of mission-critical applications, has been selected to receive a three-year HUBZone award, valued at over $4.5 million. The selection of F3 by Defense Logistics Agency (DLA) Aviation in Huntsville, Alabama, represents the largest HUBZone award in F3's history. “We are extremely pleased to have been selected to work with DLA Aviation in providing power distribution panels for aviation ground support equipment (AGSE) for the Kiowa weapon system,” said Odilo Vazquez, PhD, F3 Engineering president and managing partner. The Kiowa is a family of single-engine, single-rotor military helicopters used for observation, utility and direct fire support. F3 qualified for the award due to the fact that the company is located within Paterson, New Jersey's HUBZone (Historically Underutilized Business Zone). Created in 1997, the purpose of the HUBZone program is to provide Federal contracting assistance for qualified small business concerns in an effort to increase employment opportunities, investment, and economic development in those areas. F3 secured its first two HUBZone contracts in 2011 from the U.S. Navy in support of Naval Air Systems Command (NAVAIR). While HUBZone contracts for manufacturing requirements in support of the U.S. Military are far from plentiful, F3 has managed to secure approximately half of the awards it has bid on, according to Vazquez. This latest award comes on the heels of F3's relocation to a larger facility within Paterson's HUBZone. Vazquez notes the move was a deliberate decision based on F3's success since setting up shop in Paterson in 2009, following the company's graduation from the Technology Incubator at Picatinny Arsenal in Morris County. The new facility, which boasts 50,000 square feet of manufacturing and office space, is home to 53 employees. The company's relocation was necessitated by an impressive boost in contracts awarded over the past 20 months, including the addition of depot services, which involves inspecting and repairing support equipment that was damaged in use in the military theater. F3 has the capability to make the needed repairs and return the equipment for ongoing use. Additionally, Vazquez announced in the last quarter of 2010 that the company was planning on adding 100 jobs to its payroll over the next five years. To date, 14 positions have been added plus four student interns; many are residents of the Paterson area. manufacture highly complex products, F3 brings technical, administrative and managerial resources together to provide a total program of complex engineering and contract manufacturing solutions. For more information on F3’s dedication to providing technical guidance and support to its customers, visit http://www.f3engineering.com or call Ken Rosenbaum, General Manager at (973) 442-2290.